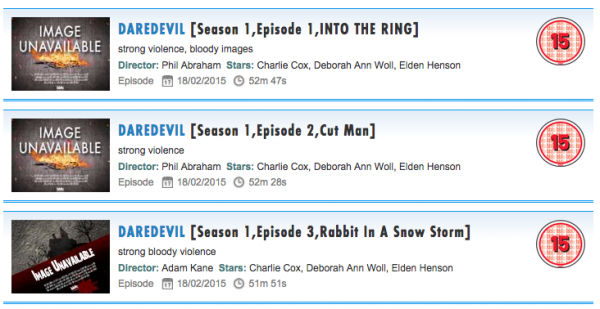 According to the British Board of Film Classification, we now have the first three episode titles for Marvel and Netflix's soon to be released Daredevil. Phil Abraham has directed 14 episodes of my favorite series on television, Mad Men, along with some work on Orange is the New Black and Ray Donovan, among others. Adam Kane, who helms episode 3, is most recently known for his work on Hannibal. These are some very stylized choices, and while it should be a big surprise given most of Netflix's original output, it's likely that Daredevil will have more of a cinematic quality than Agents of S.H.I.E.L.D. or Agent Carter. Given the collective $200 million budget for these Netflix series that Disney has invested, I'd be disappointed otherwise. Either way, Mad Men and Hannibal are two of the best looking shows in the medium, so the right talent is definitely in place. Marvel’s Daredevil follows the journey of attorney Matt Murdock, who in a tragic accident was blinded as a boy but imbued with extraordinary senses. Murdock sets up practice in his old neighborhood of Hell’s Kitchen, New York where he now fights against injustice as a respected lawyer by day and masked vigilante at night.